He also called on the government to do their bit towards funding the idea. 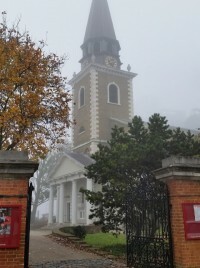 However rather than wait for funding which may never arrive, a church in Battersea became the first in it’s local area to run a trial of a free public Wi-Fi service. 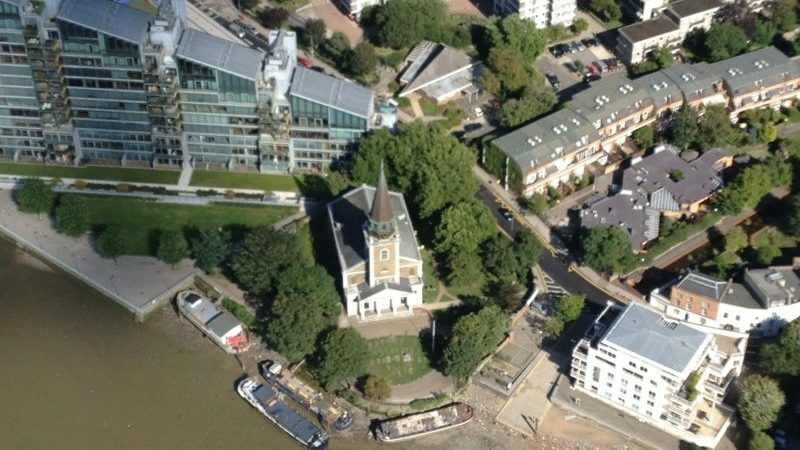 2020Media provided the service and worked with the church leadership team at St Mary’s Church, Battersea to meet the challenges of providing a robust, reliable and accessible service in a historic building. 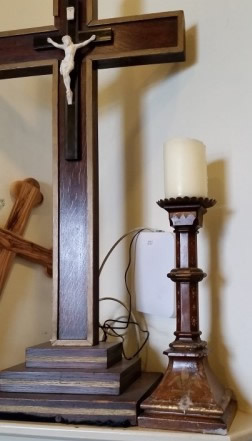 One of the challenges that will face many churches is that they are in most cases built of thick stone, which does not allow Wi-Fi signals to travel through it very well, with dead spots and degraded signal strength common. Cabling to reach optimimum access point locations is also problematic. Frequently churches are listed buildings too. It is not simply a question of redecoration cost as it would be with a newer building; historical wall surfaces must not be damaged in any way, and walls, built before the advent of electrical cable, are solid. After a site review, and taking into the account the location of the existing broadband connection in the church crypt, 2020Media came up with a plan that would cause no damage to the structure and would provide a good Wi-Fi signal strength both inside the church and in the open space in front of the building which is popular with visitors and passers-by in the warmer months. 2020Media’s approach was to combine different technologies to provide a reliable and non-intrusive solution. Powerline adapters were used to extend the reach of the wired network so that wireless access points could be located to give optimum coverage. This enabled us to bring the broadband network from the crypt into the upper floors without drilling any holes. We could then locate an enterprise-class Wi-Fi access point in secure optimum location. The service parameters were set in accordance with the leadership team’s policy, and the technology provided by 2020Media allowed key settings to be made with no additional hardware or cost. Free to use, no sign up required. Bandwidth control to ensure no user could overuse the available broadband capacity. Branded splash page to greet users as they joined the network. During the trial, anonymous usage data was gathered to provide valuable feedback to the church. Who uses Wi-Fi in church? Research in America showed that just 5% of people visiting a religious building such as a church, mosque or temple are online. To put this in context, they also found at 18% were online when visting cafés or coffee shops (see our case-study on coffee shop Wi-Fi). We found that the service was being used at all times of day, by casual visitors as well as regulars. Typical web applications people used included Skype, Facebook, Google, Spotify and email. Apple devices were about twice as popular as other manufacturers. As the coverage extended outside to building additional data showed the numbers of passersby at different times of day, and average “dwell” times – how long people were around even without connecting to Wi-Fi. This information that can be of use to organisations like religous buildings who have “walk-in” users. Finally we were quite interested to see the numbers drop as a church service started – it looks like people were turning off their phones! 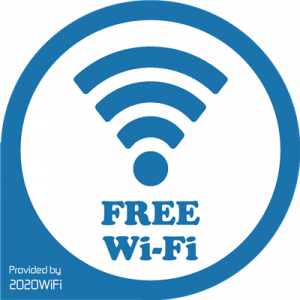 It seems that making easy to use Wi-Fi available in religous buildings such as a church, synagogue, mosque, or temple will become more and more popular. St Mary’s trial has now ended but the leadership say they will go ahead with a permanent service at a later date. Fitted to suit your unique needs. Provide reporting and analysis of visitors. Offer a range of sign-on options from Facebook to Sign-up forms to click-through Splash pages. 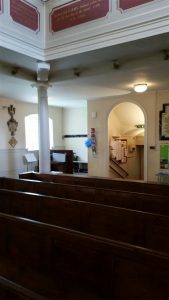 Following a bequest from a late parishioner, St Mary’s has gone ahead with a full Wi-Fi service throughout the church. Two hotspots to provide full coverage above and below. Migration from BT to 2020Media telephone service. Migration from Demon Internet (yes really!) to 2020Media Managed Fibre broadband. Cabling installation carried out by in-house team at time that suited church without damage or change to any listed areas. We are always happy to adapt our service to suit requirements – in this case we were able to arrange a 7 year licence for the Wi-Fi system so that the bequest could be best used. Two access points provide full coverage.